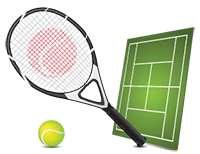 TLGTA would like to invite you to Summer Social Tennis (SST) this Saturday @ The Eglinton Flats Tennis Club. Registration is not required, but you must be a current TLGTA member. The club is located just East of Jane St, on the South side of Eglinton Ave W.
From Jane Station take the 35 Jane or 195 Jane Bus and get off at Eglinton Ave W.
From Eglinton or Eglinton West Station, take the 32 Eglinton Bus going westbound and get off at Jane. Walk East on the South Side of Eglinton, then follow the driveway down the hill into the park.